What do you get when you mix online gaming, amusement parks, family and a chance encounter with NPH? One crazy, exhausting, and overwhelming humbling family trip, of course. 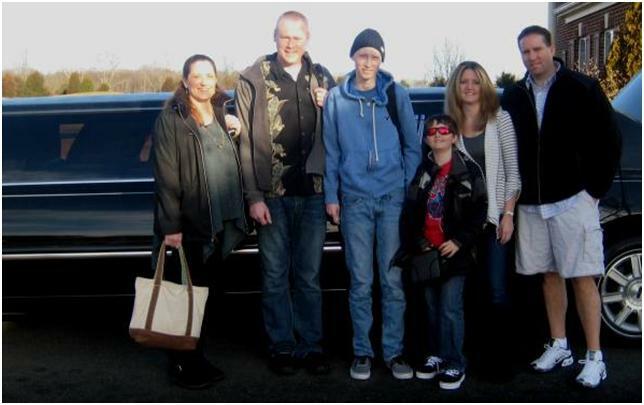 So this trip request started about 2 years ago when Make a Wish contacted Owen to see what he would want to do if he could do anything. “Visit the makers of the online game World of Warcraft” (Blizzard Entertainment) was his response. Now I’m going to admit that when he first said it (and I should preference this by saying I’m not a gamer) I thought “really, a gaming company?” Personally I think I would have opted for a trip to Australia, maybe a cruise… But it wasn’t my wish it was his. 2 weeks ago when we got the notice that the trip was finally going to happen – well by then I already understood why he chose it. He started playing the game when he was 8 (8 years ago) as a way to spend time with his dad and cousins. His cousins were on the west coast and we’re on the east coast – so their online gaming world gave them a way to stay connected, chat online with each other, and collaborate on quests that they could do together. 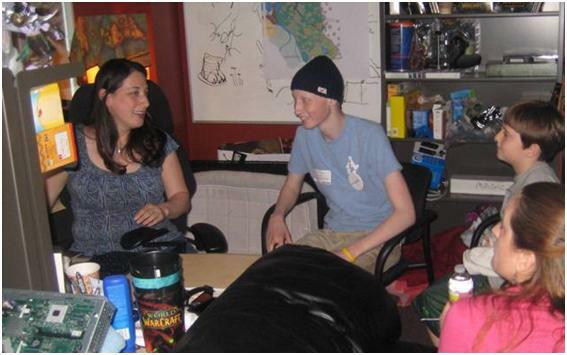 During Owen’s ongoing battle with bone cancer the game also became an escape. We would cart his laptop and internet booster with us to the hospital for chemo and whatever surgeries he might have scheduled. It was interesting because the TV would often annoy him but the game would always distract him. He would lose himself for hours within that online world; which when you’re in the hospital for weeks at a time it truly is a blessing. I should mention I’m the type of mom that tells her kids to go outside and play, to get off the computer, but things change when your child is sick. Then it becomes about letting them escape to a place that offers them peace… a diversion from their illness. 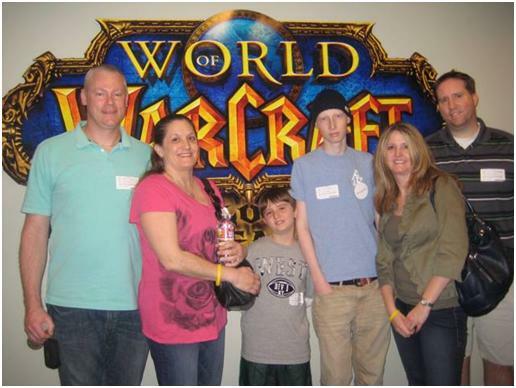 So on Wednesday, 2/22 when Make a Wish presented Owen with his trip to California to meet the creators of World of Warcraft.. Owen was excited, giddy and we were all thankful that he was given the opportunity to do so. On Friday 2/24 we traveled once again in a limo from our hotel to Irvine, California were Blizzard’s corporate headquarters are located. There we met with our Blizzard contact, Kacy who graciously spent the rest of the day showing us around campus and making sure we got to all our various activities on time. We started off the day at Blizzard by heading into a theater – where we met a couple lead designers who showed all of us how they design and create the worlds within World of Warcraft. I can’t adequately express how impressive it was to watch their presentation. The details that they build into the game, the tools that they use to build with, and just the intrinsic artistic beauty of their designs is an inspiration. We asked questions and listened to their presentation for an hour or two.. the time flew by. Next we headed to the campus cafeteria for lunch and ended up surrounded by other designers, developers, etc of the World of Warcraft game. What impressed me the most is that I know they were given as equally short notice as we were that we were coming into Blizzard – however they all were genuine, warm and happy to have us there. They loved talking about their roles in the creative process and truly sounded like they loved working for Blizzard. They shared stories of showing their kids their work and were excited for fans to see their upcoming new release. After lunch we headed up to the board room and met Chris Metzen, VP of creative development, and Rob Pardo, EVP of game design. They were both engaging and provided us another glimpse into online game development. We loved hearing how they got their start in the business, their philosophy on creative development, and their passion for what they do. Afterwards we took a tour of the campus where we were able to see various artwork and sculptures. The amount of talent contained within that campus is amazing. 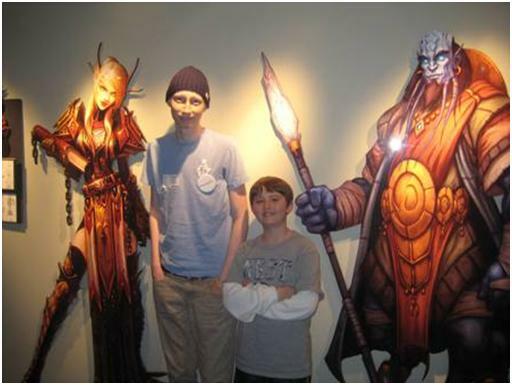 Our last stop was a trip to the World of Warcraft development team floor… where Owen really was blown away by their generosity. Owen sat down with 4 different designers/developers on this floor and was able to add his own personal elements to the next release of the World of Warcraft game. I can’t say too much since we signed a non-disclosure agreement – but once the next release of the game comes out I will provide more specifics. 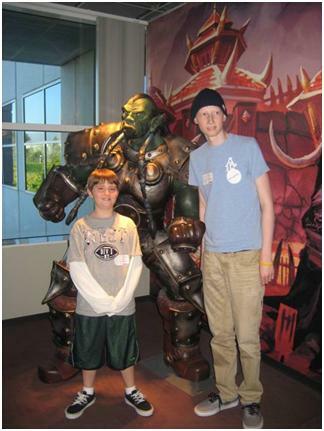 If I could say anything to the employees of Blizzard – I would say thank you for creating a memory that our son will never forget. Thank you for taking time out of your day to make him feel special. And mostly thank you for giving him (and I’m sure many others in similar situations) a place to escape to when needed. I think Owen’s smile in the first pic says it all. What a fantastic trip! I think the smiles on the parents face says it too. Sounds like a great group of people at Blizzard. I’m sure they were glad to make a special day for Owen. Now beat this cancer and we’ll see you at level 90! What an amazing adventure! How cool that it was able to be so personalized for Owen! A very touching story, I visited the well tonight, and had my character kneel down , I said a prayer to Owen and his family and was lucky enough to flip the gold coin, and made a wish. Thank you Doug. That means alot to my family and I. After reading this story after being linked to it by a friend I found the wishing well that was added for your son, and then shared this link to a few others who had been questing, and generally playing the game in the area. From all of us on Moon Guard, we wish you and your family good health and happiness. What a beautiful story for such a beautiful soul. I, too, stopped at Owen’s Wishing Well in WoW and said a prayer for him and for your family. Found Owen’s wishing well the other day, and flipped a Gold Coin into it, and made a wish for him and his family. From everyone at Barthilas – we wish you all the best. I found Owen’s Wishing Well while flying around Pandaria last night and flipped the gold coin into the well. I looked up the buff that I received from it and found links to your blog and an interview with a Blizzard Developer mentioning the well and I’m so happy I found it! It’s beautiful and I went back and said a prayer for Owen and your family. Thank you for sharing your story! That means a lot to Owen’s family and friends. Nymphadora & the rest of the Silvermoon community – thank you for the prayer and visiting Owen’s wishing well. The game and the well meant a lot to him… and it’s a wonderful tribute that we are thankful for. I am at Owen’s wishing well and when the coin flips in, my wish is for Peace of heart for Owen and his family. Thank you for sharing this wonderful story. I’m saddened I hadn’t heard about it sooner. I will often travel, in-game, to Owen’s Wishing Well and offer a thought or two to him. Thank You Stephen – it warms our heart to know that people think of him when they reach the well. It’s a never ending tribute that we are so grateful to Blizzard for granting him. Thank you Jill your wish means a lot to our family. I didn’t know about this spot until yesterday, but I flew out to the Jade Forest to see where it was. I flipped a coin for Owen and all of you in his family. I am sad that I never met him, but happy that a piece of him – of things he designed and chose – will be in the game he loved until the day the servers go down. I took a screenshot, too, so I am linking it here. Thank you Heather, for the kind words. I need to write a new article with an update now that the release has been out. I (we) were too sad when it first came out but now that time has passed it might be nice to explain some of the parts of Owen’s well as well as a character that exists elsewhere in the game that he designed. I did the same thing when I stumbled upon Owen’s Wishing Well through a surf of wow youtube, I went there and kneeled my character at the edge of the fountain and after playing for over a year discovered something very cool in that moment…. I play the game but don’t talk or interact much so I had not used the /macros very often. I clicked /pray and (I realize this is incredibly nerdy of me but…) was epically excited to see that it actually IS a macro and my character prayed. I really studied each item around the well and tried to imagine Owen’s mindset as he chose the items. One has me curious…what is the reason for the bolts (?) in the chinese take-out container? Oh god! When I saw the well in WoW and searched it up I started crying. Can’t believe blizzard does something like this. It’s amazing. 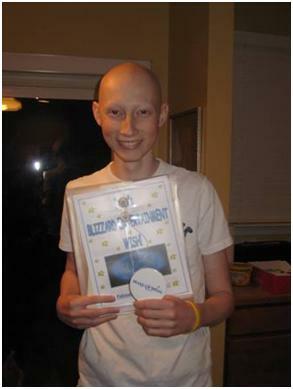 My deepest respects to blizzard, and my biggest condolences to Owen’s family. Thank you for the kind words for our family. Just visited this guy tonight and got the make a wish buff and went to wowhead to check it out when I came across this link and this story. This makes me smile and tear at the same time. So happy that Blizzard does things for the fans especially something like this. May ownen’s spirit live forever in this game and I’m glad I got to hear and see his story.